As we multiply the devices we own, our wires get even more tangled up. Qi wireless charging helps clean up this mess, but there are still some devices that need to be charged through the usual cord. Talé can help make the wires of charging disappear in a clean and aesthetically pleasing way. 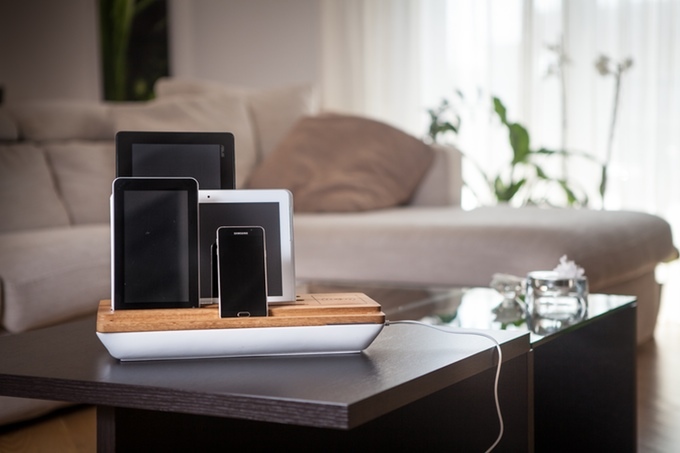 Talé is a docking station that can accommodate up to 6 devices at the same time. It also has Qi wireless charging built-in for the Qi-enabled devices. Basically, it groups up all your charging cords inside and making it available to use whenever needed. You’ll have to plug the docking station from its 220V/110V AC adapter to your wall socket. Then you can remove the top lid and plug all your charging cords for your devices in the hub. The top lid has small slits where you can pop the other side of the cord through. You’ll have to plug the docking station from its 220V/110V AC adapter to your wall socket. Then you can remove the top lid and plug all your charging cords for your devices in the hub. The top lid has small slits where you can pop the other side of the cord through. You can just leave all those cords there, then plug and dock when you want to charge your smartphones or tablets. There’s also an extra USB port on the side for other devices that needs to be charged such as powerbanks or Bluetooth speakers. A LED light indicator at the front right side indicates when the Qi wireless charging is in use or not. There’s also sound amplification and diffusion for the front-most docking where the sound can be naturally amplified. This will work for devices that have their speakers at the bottom such as the Apple iPhone line. Can I wirelessly charge my iPad?